That’s a big claim: what makes it so good? Sonically, Deluxe manages to combine the kosmische musik electronic textures and synth experiments that make up one side of krautrock with the motorik rhythm and long-hair guitar abuse that makes up the other. No one else that I’ve heard quite managed to fuse these two approaches, but here it’s seamless. The debut album had been much closer to Cluster’s warm electronic ambience, but Deluxe saw Rother, and Guru Guru drummer Mani Neumeier, cut loose and rip it up a little over the textures produced by Hans-Joachim Roedelius and Dieter Möbius (Cluster), not least on Monza, which David Bowie didn’t so much rip-off as just use as a backing track for the song Red Sails from Lodger. The first three tracks are long – between seven and eleven minutes each – while the last three are shorter – four to six minutes – but Deluxe isn’t a record with an experimental side and a pop side; the whole thing is more immediate and song-based than a lot of other kosmische krautrock, and there are even vocals on some tracks, albeit mysterious, non-musical group chants rather than sing-a-long lyrics, but it’s even, though undulating, in tone and pace. There’s a real sense of warmth and playfulness to the record too, qualities often overlooked when talking about and listening to German music, but which actually shoot through a lot it. Rob listened: I confess I was wandering around a little while the first couple of track from ‘Deluxe’ played. I’m very sorry. I’m no krautrock aficionado. It goes as far as Neu! and ‘Ege Bamyasi’ for me, even though so much of the music I love was so heavily influenced by the scene (The Fall, PiL, Animal Collective). So it was good to hear this, although I was surprised by how unstructured it sounded. That’s me thinking ‘I’m So Green’ and ‘Hallogallo’. Sorry. Tom and Nick have enjoyed jousting with their CAN views over recent months, a conversation i’m blissfully excluded from. Tonight I was happy just to sit back and listen to some synths so old and great sounding, you could almost feel the valves squeaking. Nice stuff, would have preferred more grooves, but I know nothing. Tom Listened: Rob has this theory about the colour of album covers. I know what he means. Spiderland and Closer could never be anything other than black and white, whilst the music on Sgt Pepper’s, Bummed and Forever Changes could never warrant a monochrome cover. But what comes first, the colour of the music, or the artwork? Does the album cover make you see that colour in the music or merely reflect it? The power of suggestion. I can’t help thinking it’s the former…after all, why is it that I see the sounds of Blue Bell Knoll by the Cocteau Twins as grey blue, whilst Heaven and Las Vegas is most definitely vibrant pinks, reds and oranges? Surely the music (and Liz Fraser’s warblings) are not THAT different between the two consecutive releases! 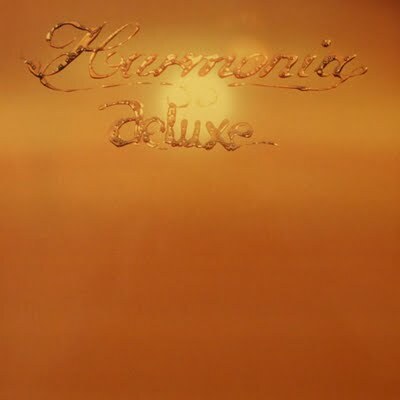 Which brings me to Deluxe by Harmonia. I couldn’t disassociate the music from that mid 70s Some Mother’s Do ‘Ave ‘Em orangey brown no matter how hard I tried. The odd thing was that I found myself really enjoying the music one second and then placing it, in all its beigeness, within its historical context smack bang in the middle of an Open University programme on particle physics, the next. I’m not really sure if the album cover influenced this thought process but there’s no denying its browny orangey colour. I love Can (not unequivocally but on the whole), admire Faust, like Amon Duul, but have always found Neu’s rather inhuman motorik hard to get into and I guess Michael Rother’s contribution to this album, along with the colour of the music made it another album that I would need to spend time with to fully appreciate. Graham Listened: I admitted early on that this was a style way out of my comfort zone. However I really enjoyed this. I was expecting mucho minimalist, but found this really engaging, to the point that I can imagine getting too carried away while listening on the motorway or on a long train journey. I would have to be in the mood and in the right enviroment to give this a full listen, but I’m sure it would be rewarding. I admitted early on that this was a style way out of my comfort zone. However I really enjoyed this. I was expecting mucho minimalist, but found this really engaging, to the point that I can imagine getting too carried away while listening on the motorway or on a long train journey. I would have to be in the mood and in the right enviroment to give this a full listen, but I’m sure it would be rewarding.